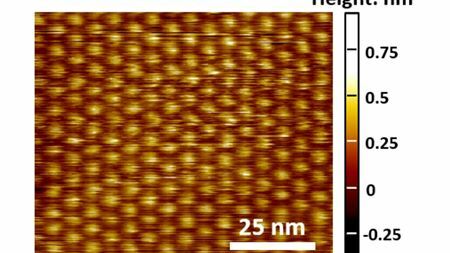 Defects in two-dimensional materials can enhance their physical, electrochemical, magnetic, energy and catalytic properties. Lithium-ion battery technology is starting to reach its physical limits. Scientists have discovered that a reaction involving the impurity hydrogen fluoride helps form the solid-electrolyte interphase in lithium-ion batteries. A novel X-ray nanoprobe beamline can observe materials down to a scale of just 10nm and capture multiple images of different material properties. Two-layered polymer matrix antidote to oxygen poisoning of biomimetic fuel cell catalyst. Researchers have created a water-based zinc battery that is simultaneously powerful, rechargeable and intrinsically safe. Using a multi-layered stack of metal films, researchers have shown that under certain conditions superconductors can also carry currents of 'spin'. Thin, engineered material that controls the redirection and reflection of sound waves with near perfect efficiency. Find out about the recipients of the 2018 Outstanding review awards from the Acta Journals. A novel alloy of iron, chromium and aluminum makes a safer cladding for nuclear fuel rods than conventional zirconium-containing alloys. Sodium-ion electrolyte with newly discovered structure could be used in solid-state batteries. A novel database of inorganic thin-film materials for energy applications developed by NREL scientists contains more than 140,000 sample entries. A new material made of sodium, phosphorous, tin and sulfur, with a tetragonal crystal shape, should make an effective electrolyte in solid-state batteries. Constant illumination relaxes the crystal lattice of a perovskite material, making it more efficient at collecting sunlight and converting it to energy. Coating the anode with a solid-electrolyte interphase has allowed the creation of a rechargeable non-aqueous magnesium-metal battery. Scientists have developed the first technique able to meld ions from up to eight different elements to form high entropy alloyed nanoparticles. When placed between the two electrodes of a lithium-metal battery, a graphene oxide 'nanosheet' can prevent the formation of lithium dendrites.